With Into The Wind, I will have much more control over the entire publication process. That includes decisions on the book's cover. It became clear very early on that putting together a book cover to represent the mood and spirit of Into The Wind using existing clip art would be difficult if not impossible. Fortunately, I know a talented young artist named Laynie. Even though she is still in high school, Laynie teaches painting classes at a local craft store and has her own custom painting business called Laynie's Custom Paints. I felt like my vision for a cover image matched well with Laynie's abilities, and I was right! 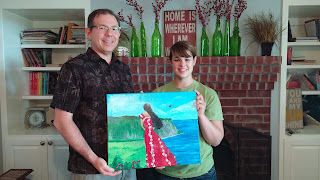 Last week, newsletter readers got a look at the original painting I commissioned from the lovely and talented Laynie. Today I am excited to share the picture with everyone. Readers will recognize the Waipio Valley Lookout, which played a significant role in both Bumpy Landings and does so again in Into The Wind. Although the image doesn't come from an actual scene in either book, I think it perfectly captures the feeling of the story. I have this painting in my office. It's also the wallpaper on my phone, and I smile every time I see it! There is still a lot of work to go from raw artwork - no matter how great - to an actual book cover. But the mock-ups I have seen give me the chills. I can't wait to reveal the final cover design in the December edition of The Delusion Tree news. If you aren't on the mailing list, sign up now.